I spent the long 4th of July holiday weekend visiting colleges with my daughter. She’s a “rising Senior” in high school, so we are picking out the schools that she will apply to in the fall. It’s a stressful time for a young person, and as a parent I know the enormity of the decision. My years at Cornell were among the best of my life, and I want the same for my two kids. But of course as a marketer, and I find it hard to turn myself off. So as we are sitting in the information sessions and doing tours of the schools, I can’t help myself but to think of these schools as brands and dissect how they present themselves. It’s amazing how much of it sounds all the same. These brands could use some positioning work. I know, I’m terrible! Visiting school number two for the weekend, we are walking around William & Mary down in Virginia, just about to go into one of the dorm rooms — and even Mr. Marketer here gets caught by surprise. The dorm room has been outfitted by Bed Bath & Beyond! Talk about being at the right place at the right time. And the brand is not shy about it with tons of posters, coupons, and accessories promoting their offerings. The secret sauce of marketing is to intersect with your consumer right at the moment when they may be considering you — and add value to their lives. Exactly what Bed Bath & Beyond did during a campus tour! 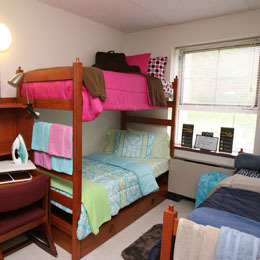 They made the room look adorable, and completely took away the anxiety of what living quarters might be like for a Freshman. As part of a corporate sponsorship with select schools across the country, the brand even sponsors field trips with dorm advisers to help incoming Freshman get settled. Decorating advice, easy access, and money saving offers, right at the time of need. Brilliant marketing that has put Bed Bath & Beyond on my radar — and on the radar of hundreds of thousands of college students looking to outfit their dorm rooms. What is Your Burning Question?